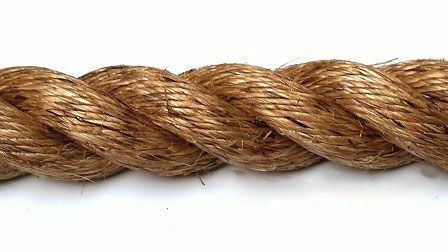 32mm Grade 1 Natural Manila Rope sold cut to length by the metre. Please enter the length you require in metres in the quantity box below. Your 32mm Manila Rope will be sent in one continuous length, if you want more than one length please order the total and then indicate your requirements in the customer comments box at check out. Our manufacturer has labeled this rope as 32mm but we measure the actual diameter as about 35mm. The 32mm is approved for use as a Tug of War Rope by the Tug of War Association. The length is usually not less than 35m. It is important to read our Q&A pageregarding possible shrinkage and actual rope diameters and our Helpful Hintspage. The standard finish for this rope is for both the left and right ends to be taped. If you would like to have them either whipped, soft spliced or hard spliced please visit our 'rope end finishes' category.